Another day, another period of growth for public Bitcoin BCH mining pool SVPool. Data on Coin Dance showed that as of Nov. 6, SVPool holds 10.42% of global Bitcoin BCH hash power. Following behind are ViaBTC (9.72%), OKMiner (7.64%), Bitcoin.com (5.56%), BTC.com (4.86%), Antpool (4.17%), Waterhole (2.08%), P2Pool and GMO IG (1.39%), and Huobi and Northern Bitcoin (0.69%). BMG Pool takes the top spot with 13.19%, followed by CoinGeek and BTC.top with 11.11% respectively. 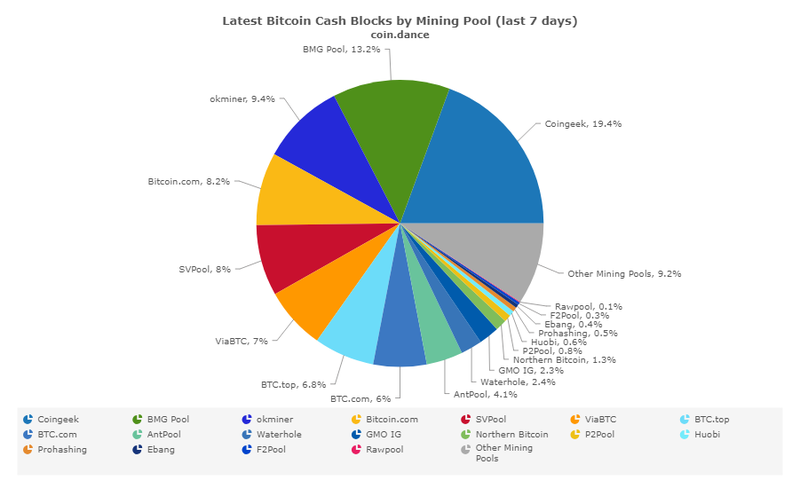 On a seven-day basis, SVPool already accounts for 8% of the Bitcoin BCH hash power. SVPool is a personal initiative of nChain Chief Scientist Dr. Craig Wright. It offers zero fees to miners and launching with initial Pay-per-last-N-shares (PPLNS), and plans to add more features and Pay-per-share plus (PPS+) options in the coming weeks. Customer hash for the public mining pool, which opened for business last Oct. 22, is currently around 30,000 miners. 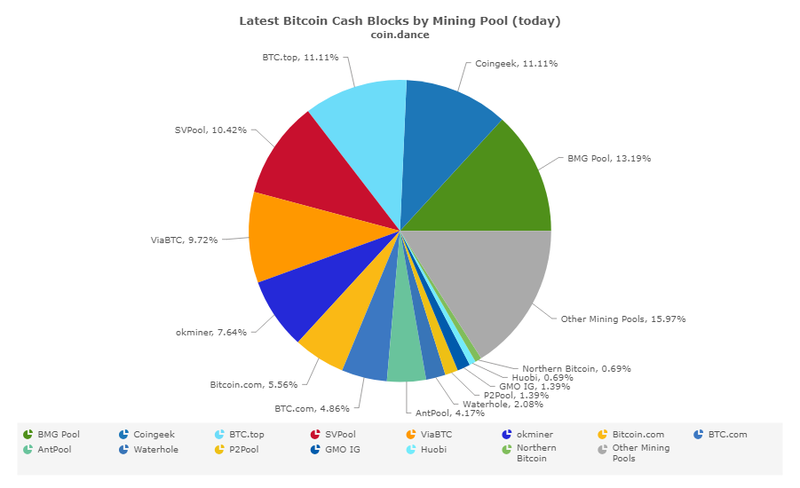 SVPool is managed by CoinGeek Mining and proudly runs the Bitcoin SV full node implementation, which is also experiencing a growth in popularity—and support—within the BCH community. Over the weekend, Jack C. Liu, former chief strategy officer of digital asset exchange OKEx and current advisor to Bitcoin Cash Association, announced his support of the full node implementation designed to fulfil the Satoshi Vision for Bitcoin. Bitcoin Cash was built on the premise that hashpower determines consensus, if you reject that premise then you reject Bitcoin Cash. If Bitcoin SV wins the hash war, then it is Bitcoin Cash, even if this means it’s led by Craig Wright and Calvin Ayre. Cryptoanarchy is strange! 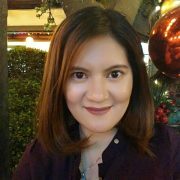 Unlike other competing BCH implementations, such as Bitcoin ABC, that seek to experiment with unnecessary technical changes to the Bitcoin protocol, Bitcoin SV’s roadmap will restore the original Satoshi protocol, keep it stable, enable the BCH network to massively scale, and professionalize Bitcoin. The Bitcoin SV implementation will allow global enterprises to confidently operate and build their major projects on a stable, scalable BCH protocol. To protect this vision of a scalable, workable money for the entire world, CoinGeek and its founder, Antiguan entrepreneur Calvin Ayre, have poured resources and money into several projects—from Terab to Cash Shuffle—to spread the message of BCH. CoinGeek recently awarded £5 million to Tokenized, an on-chain token system designed exclusively for the BCH network and proudly uses the original Satoshi Vision design of Bitcoin. CoinGeek’s tokenization contest is still open, with a secondary award of £1 million up for grabs. Interested in learning more about Satoshi Vision, Bitcoin SV and SVPool? Join the gathering of miners at the upcoming Miners Day, happening as part of the CoinGeek Week Conference in London on Nov. 27-30. It’s the perfect opportunity to meet the members of the BCH community and discuss not just the ongoing reality of Miners Choice for Bitcoin going forward but also why enterprise applications needing Bitcoin should stop moving in order for the ecosystem to grow. Secure your seat to the four-day conference today via Eventbrite. Also, join the (free) bComm Association and be part of the revolution.